The good news is that Peter Jackson’s final installment of his unnecessarily long adaptation of The Hobbit shows improvement over its predecessors. The downside is that it’s an a degree of improvement akin to the Star Wars prequels: better, but still a slog to get through with only a few rewarding moments. At best, it makes one appreciate the elegance of the Lord of the Rings films even more. The Battle of the Five Armies begins immediately after the closing credits of The Desolation of Smaug, picking up the pointless cliffhanger ending of that film and dispatching the rampaging dragon in less than ten minutes of screen time. The poor citizens are Laketown have become refugees following Smaug’s rampage, and seek shelter at the Lonely Mountain, as well as their share of the dragon’s treasure horde, as promised by dwarf-who-would-be-king Thorin (Richard Armitage). Thranduil (Lee Pace) and his contingent of elves also arrive, seeking the jewels that belong to his people. Unfortunately for them, Thorin has developed a bad case of gold fever, grown obsessive over finding the Arkenstone so that he fully reclaim and restore the dwarf kingdom, and is surprisingly unwilling to make good on his promises. These leads to much saber rattling as the three factions edge closer and closer to a war that the circling forces of darkness would be happy to exploit. Meanwhile, back at the ranch, Galadriel (Cate Blanchett), Elrond (Hugo Weaving), and Saruman (Christopher Lee) rescue Gandalf (Ian McKellen) and learn of the impending return of Sauron in a gratuitous bit of fan service that comes across as anticlimactic closure to a tedious thread needlessly spread across three movies. All of this busyness leads to leads to the movie’s titular battle, a massive piece of busyness that takes up 45 minutes of a hefty 144-minute running time. On the plus side, now that the finish line is in sight, The Five Armies is free of the meandering storytelling and needless padding that bogged down the first two installments. It’s fast-paced and more focused, though the momentum sometimes wanes. 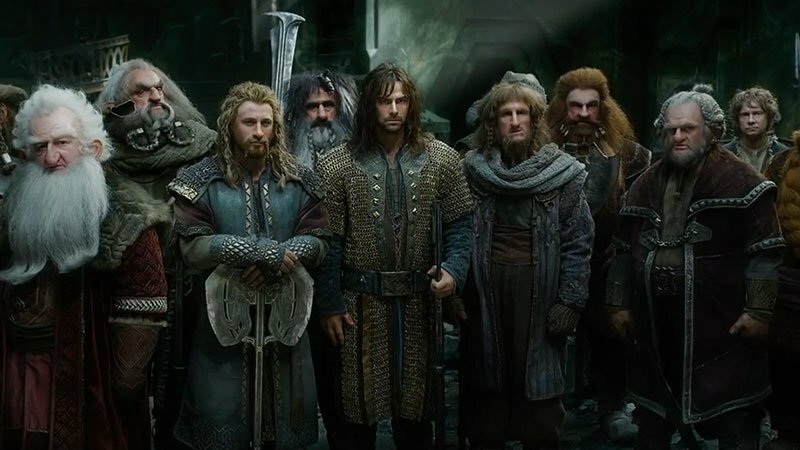 Still, the damage is done and the movie can’t entirely shake off the fatal flaws that have dogged the trilogy: The title character, the Everyman (Every-hobbit? Every-Middle-Earthling? Whatever.) proxy for the audience and moral compass of the story, is pushed into the background for much of it — sad, considering the strength of Martin Freeman’s performance. The tepid Tauriel-Legolas-Fili love triangle, not present in the novel, never rises above melodrama. The material sutured on to expand the project into a trilogy feels blatantly tacked on and inconsequential. At this point it’s fair to say that Jackson’s weakness for narrative bloat has now officially defeated him. The original novel was a relatively simple and straightforward adventure tale; Jackson’s interpretation has been anything but that. Now complete, it stands as tone-deaf product that suffocates the material with a morass of hollow spectacle. It’s sadly ironic to see author J.R.R. Tolkien’s anti-greed, anti-war tale turned into this.